Information about wood trim including crown mould, base, casing, chair rail, etc., the wood species we work with and life on the beaches of the Florida panhandle. Good Millwork: Classical Architectural Moldings, originally uploaded by Good Millwork. When commencing study of the classical elements, it is logical to begin with moldings. Moldings are the smallest physical units -- the atoms, as it were -- of classical architecture, and so are easier to understand at first than the larger, more complex members formed from their combination. Starting with moldings is also convenient because they crystallize in minute form nearly all the ideas that define classicism itself. Indeed, the first lesson to be drawn from moldings is that those who work in the classical manner inherit a pre-established vocabulary and grammar. With moldings, that standard alphabet is generally considered to consist of the 14 varieties you can see in Fig. 1.. Analysis of shape is one way we classify moldings. On the most elemental level, we first distinguish between STRAIGHT and CURVED moldings. In the former group there are just two profiles: the FILLET and the FASCIA, which are distinguished by their comparative size. FILLET is the term we give to a small, straight member, while FASCIA refers to a large flat profile. This size distinction is relative; the measured size of a FILLET could be considerable if you're talking about a molding situated on the exterior of a huge building, or small, if the FILLET is part of a piece of cabinetry where profiles tend to be miniature. 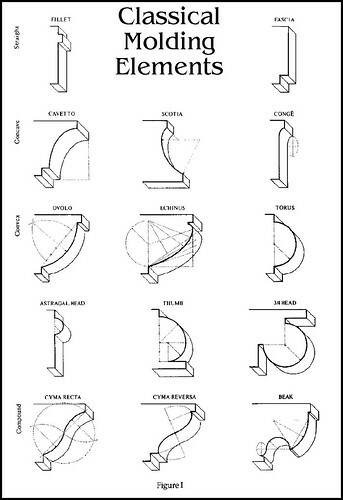 Classification of curved moldings is more involved because we have several sub-groups: the CONCAVE, the CONVEX, and the COMPOUND. In the concave group are the CAVETTO, which is roughly a quarter-circle; the SCOTIA, which is actually a curve of greater rotation than a semi-circle; and the CONG, which combines both straight and curved elements in one profile. Next are the convex moldings. Those equalling or approximating a quarter-circle include the OVOLO and a sort of cousin called the ECHINUS. The difference between them is mostly a matter of geometry; the OVOLO is usually drawn with a compass, while the ECHINUS is a type of non-circular curve that will be discussed below. In the half-round class, we have something similar to the condition of the FILLET and the FASCIA. This time, a relatively large half-round is known as the TORUS, and a smaller version is called the HEAD or ASTRAGAL. Another relation to the TORUS is the THUMB, again the difference being one of geometric method. The TORUS is usually a full half-circle, while the THUMB is made up of radii of varying lengths, which endows the curve with a directional bias. Moving from the semi-circular, we come to the THREE-QUARTER ROUND, sometimes known as the THREE-QUARTER HEAD, so-called because three-fourths of its perimeter is exposed. Compound profiles combine both concave and convex elements in a single molding. The CYMA RECTA, from the Greek words for "wave" and "upright," is concave above and convex below. Its name is perhaps derived from its resemblance to an upright ocean wave about to crest. Were we to reverse this arrangement, however, and situate the protruding portion above the hollow, then we would discover the aptly-named CYMA REVERSA. Finally, we end with the BEAK molding -- the most complex of the profile types. The BEAK is formed from a variety of curved elements, and usually incorporates a chamfer, or diagonal cut. Among the standard types it is the only profile that is undercut. Thus what you see when viewing the molding straight-on is unlike what you see gazing up at it from below. To emphasize the positive nature of mass, classical moldings, with few exceptions, are additive; that is, they usually project out from a given plane. On Mahogany: Genuine or Imposter?